Hyundai is doing something that no other car manufacturer has dared to do in the UK. It's offering a 5 year, unlimited mileage, fully transferable, manufacturer’s warranty across the entire passenger car range. That means you can drive wherever you like, as many times as you like and, no matter how many miles you clock up, your car is still covered for any breakdowns or repairs that may occur.^ Not that you’ll have many. Every Hyundai is built with quality as a top priority, so you can sit back, relax and enjoy miles and miles of trouble-free driving. 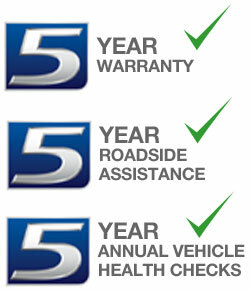 A 5 year fully transferable, unlimited mileage* warranty. No other UK car manufacturer offers the same level of security and assurance as the Hyundai warranty and this reflects the brand’s confidence in the quality and reliability of its vehicles. 24-hour roadside assistance anywhere in the UK or Channel Islands. For 5 years, in addition to your main annual service, your Arnold Clark Hyundai dealer will perform a health check ensuring your car is kept in the best possible condition, this includes key elements of car care across a range of areas such as engine, transmission, steering, suspension and brake systems. For greatest convenience, you may wish to time the booking of this free of charge healthcheck with your annual service. For more information about the Hyundai 5 YEAR TRIPLE CARE Service, contact us or visit your nearest Arnold Clark Hyundai branch.